Great news! OG’s Speculative Fiction, Issue 24 has been released! 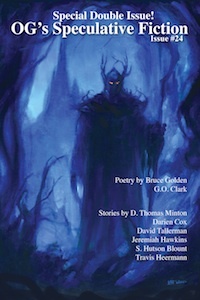 It is a special double issue full of great speculative fiction stories from authors such as Darien Cox, D. Thomas Minton, David Tallerman, Jeremiah Hawkins, S. Hutson Blount and Travis Heermann as well as poetry from Bruce Golden and G.O. Clark. It is one of our finest issues with over 100 pages of great reading. Let us know what you think of the issue! Don’t miss our other issues of OG’s Speculative Fiction if you haven’t read them.